Here’s part 1! 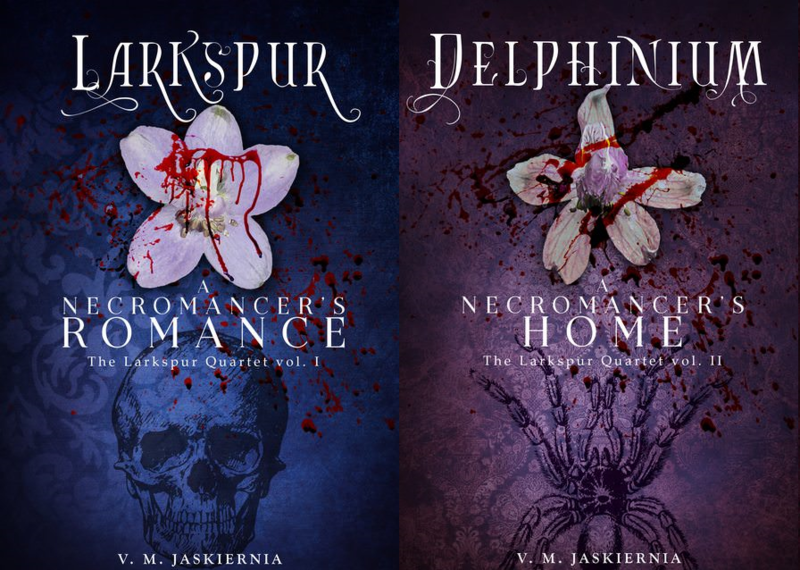 Remember, this is a beta/advanced-copy of Delphinium, being serialized on my blog because I’m horrible at getting things done. This way I’m working on it every day, and giving something back. This is *not* the final edition of the book. It’ll still be read through and tweaked, by me and my editor, before a final copy is up for sale. I can assure you the main story won’t change, but there may be scenes added in, or rewritten, and other small changes that make this the ‘beta’ version and not the final. Similarly, if you find any issue or are confused, please comment! Or if you like it, please comment then too. She had become ill. A cough began the day of their departure and lasted throughout the journey, bringing with it chills and taking away her appetite. Three days from Piques’s capital they were commanded to stop and rest in town, her suitor refusing to go further until she improved. As his orders were that of duc and doctor none could argue. He carried her to the most elegant suite at the inn as if he were already her husband, laying her down in bed, but then moving to the hall while a maid helped her undress. When he entered again she was curled up under the covers and shivering. Ignoring the maid he made his way to the lady, kissing her forehead and letting his lips linger to both comfort and assess a fever. “I am unfamiliar with what ails you, my dear,” he said, stroking back her curls. Her blue eyes were unfocused, and her skin was pale save for blotches on her cheeks. “I will consult with local physicians about this. You will be better soon.” His studies had been in surgery, not illness, but he would take extraordinary measures to make her well. “Forgive me for being so much trouble—” A kiss silenced her. The thought that he could catch her illness entered his mind for a moment, but the desire to show her no blame won over. And if he did fall ill, felt the symptoms himself, at least he might be able to hold back the spirits that plagued her. She broke the kiss to cough. Spots of red betrayed how much worse her condition had become. “Rest for now,” he said softly. He took out a handkerchief and wiped away the blood, then tucked her in. She lay facing away and only mumbled a reply. The duc remained standing by her side, not wanting to leave her, one hand still stroking blonde hair that was damp from fever and sweat. “Thank you, you may go,” he replied over his shoulder. Pouring his love a glass of diluted wine he paused after setting down the glass- the maid had left and the door was barely ajar. He took off his gloves and, with a pin taken from the folds of his clothing, he pricked a finger. Blood seeped out, becoming dark first with saturation and then in hue. When it dripped down his hand the trail left behind was black. He let several drops of blood fall into her wine before putting on his gloves again. They were black as well, and by sight one would not see the bloodstains. He would change them when he had a spare moment. “Sleep well, Lizzy. Do not forget to drink. I will have a light dinner brought to you later.” She did not reply a second time, already asleep or too weak to answer. He closed the door behind himself softly, uncertain if he wanted to leave without making her at least drink first. But no, she needed to rest, it would do her good before any magic enchanted her. And he needed his own rest before using any cræft. He went to his rooms, smiling when he walked in to see his cat lying on a pillow. He sat beside her and pulled the black queen onto his lap, not a care for the expensive clothes that would be covered in fur. He held her close as a pet from childhood and not the Familiar she usually was. Pluta pressed herself to her master. He did not often worry, but Elizabeth had become close to him again these last few weeks. “What is the worst that can happen?” the cat said. To most it would sound like purring or mewling, but to him and those that knew necrocræft it would be human tongue. Illness was something one learned to understand and live with in Clandestina. While some of the best healers and doctors of the world resided in this realm, it was by necessity, as the guardians who had once controlled death and illness were all but gone. Some resided in other realms, most had just disappeared, yet the magic of a realm was innate. Other places could continue to thrive without ever knowing about the keres; this land of fée and mortal was in turmoil. But some did not accept so easily that control was out of their grasp. “My Lady,” Pierre called out to the silence around him. The bed shifted as another sat behind him, arms wrapping around his waist. Her head rested between his shoulder-blades. She brought a chill with her, as if she had stood out in the snow for far too long and had yet to warm, and the duc shivered in her embrace. “The spirits are not mine,” Mora said. “They come from my plane, but only in ancestry.” She was not a goddess. Neither all-knowing nor all-powerful, she was a being that happened to exist in another plane and have more magic than most– A daimon. The last ker. Legend and time, though, had turned her into a being that responded to Death. And sometimes Life. “Will you help?” he asked. She had been wary of Elizabeth since the daughter of the comte had returned to Pierre’s life. Had been jealous even that he had chosen to come back to life after committing suicide (the final of Death’s tests) instead of staying with her in the land of the dead. “I will not hinder.” She placed a kiss of ice to the nape of his neck, and the weight on the bed vanished. The cold remained. He made his way to the dining hall. Most of who had accompanied him were left to have meals while rooms were sorted. From guards to those driving the carriages, miscellaneous staff, and other nobles who had been at the castle for his birthday party just two weeks past. He had become ill that evening, through the use of his cræft, and Elizabeth stayed with him and kept him company until he was well. He had in turn asked her to join him for the spring in Piques. Raising a finger to hush the man that would announce his presence, Pierre Salvador, duc de Piques, walked through the throng of people until he found his student. A gifted boy in healing and similar skills, Wolfram was sitting among a group of boys that helped with the animals. “Have you heard of this illness?” the duc asked, interrupting some story about the dogs. The young man nodded, though the others seemed unsure of what to do with the duc before them. “Yes, Your Grace. But I have only heard of it in passing. I do not know the treatment. I have just heard Lord Ophion mention it.” Before being with the duc he had been a student of the royal physician. Pierre nodded, the tightening of his grip on his cane the only visible sign of discomfort. “Let us go wait for the healers and see if this has been happening in the area. Come along.” Wolfram was not needed, but he was the closest the duc had to a human friend within this party, aside from Lizzy. Thinking about medicine or cræft at least kept his mind occupied and relevant to trying to help her. The food was forgotten, Wolfram standing and attending his lord while leaving behind the others. Several more people offered to come, but Pierre ignored them and walked quickly with only his apprentice. “It presents with a harsh cough that can lead to blood coming up from the lungs and throat. The few cases he has seen…” Hesitation, and Wolfram did not finish what he was going to say. “Your Grace,” the doctor greeted when he entered the room. After trying to understand the spirits of the illness and failing, Pierre and Wolfram had retired to wait until the physician came. The duc stood and crossed the room to shake his hand, a gesture from physician to physician and not lord to citizen. “The presence of death,” the doctor replied. Pierre remained composed, but Wolfram coughed to hide his intake of breath. The doctor did not pay him any attention. “How is this treated?” the duc continued. They shook hands once more and the doctor left. She awoke to a gentle hand shaking her shoulder. Lizzy thanked the nurse, sitting and receiving a cup filled with some concontion that smelt of mint. A dinner tray with soup and a roll was beside her bed. Her fever must still be high for she thought she saw wings on the woman’s back.